A dusty spiral galaxy appears to be rotating on edge, like a pinwheel, as it slides through the larger, bright galaxy NGC 1275 in this NASA Hubble Space Telescope image. These images, taken with Hubble's Wide Field Planetary Camera 2 (WFPC2), show traces of spiral structure accompanied by dramatic dust lanes and bright blue regions that mark areas of active star formation. Detailed observations of NGC 1275 indicate that the dusty material belongs to a spiral system seen nearly edge-on in the foreground. The second galaxy, lying beyond the first, is actually a giant elliptical with peculiar faint spiral structure in its nucleus. These galaxies are believed to be colliding at over 6 million miles per hour. NGC 1275 is about 235 million light-years away in the constellation Perseus. Embedded in the center of a large cluster of galaxies known as the Perseus Cluster, it is also known to emit a powerful signal at both X-ray and radio frequencies. The galaxy collision causes the gas and dust already existing in the central bright galaxy to swirl into the center of the object. The X-ray and radio emission indicates the probable existence of a black hole at the bright galaxy's center. 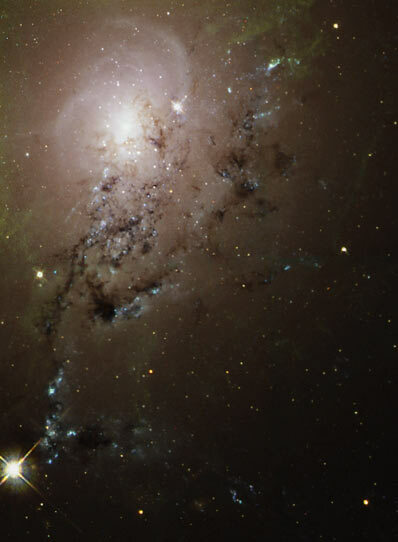 While the dark dusty material in the Hubble image falls inward, NGC 1275 displays intricate filamentary structures at a much larger scale outside the image. This is a typical feature of bright cluster galaxies. Additional observational evidence of strong interactions between at least two galaxies, and possibly a few smaller galaxies, includes the formation of new stars and large star clusters. Although similar in shape to the old globular clusters in the Milky Way galaxy, NGC 1275's clusters are much younger and contain 100,000 to a million stars each.